In this video I show the effect that dwell has upon the stitching. The dwell button is found in the ribbon on the sew quilt page. Turning dwell on makes the machine pause momentarily at the dwell points of a pattern. It can give greater definition to a design. However, if you are having trouble with thread breakage, turn dwell off. 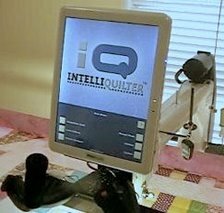 Re-starting a pantograph after shutting down iQ.